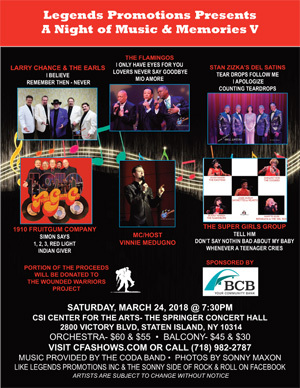 Legends Promotions proudly presents “A Night of Music & Memories V” at the CSI Center for the Arts Springer Concert Hall. The show will be hosted by “Mr. Staten Island” - Vinnie Medugno, known for his charismatic on stage persona and presence. When Vinnie is hosting an event, he undoubtedly will make you feel like the only person in the room. Performing on the billing will be The Super Girl Group, a quintet of female singers who sang with some of the 1960’s most famous girl groups, which include: Margaret Williams of The Cookies: Nanette Licari of Reparata and The Delrons; Louise Murray of The Jaynettes; Beverly Warren from The Raindrops and Lillian Walker-Moss of The Exciters. The 1910 Fruitgum Company virtually exploded onto the National Charts in 1968 with the first single release, “Simon Says”. The song quickly moved up the charts to become a #2 record on the national charts and reached the top of the charts in the United Kingdom. Other hits included “Indian Giver,” "1, 2, 3, Red Light," and "Yummy, Yummy, Yummy." Today, the group is with original member Frank Jeckell, Mick Mansueto, Glenn Lewis, Bobby Brescia, and Keith Crane. The Del Satins were formed in 1958 in Manhattan through a merger of two existing street corner groups, The Yorkville Melodies and The Jokers. The original members were Stan Zizka (lead), Fred Ferrara (baritone), his brother Tom Ferrara (bass), Leslie Cauchi (first tenor), and Keith Koestner (second tenor). In 1961 they recorded their debut single, “I’ll Pray For You,” followed by “Teardrops Follow Me,“ and “Best Wishes, Good Luck and Goodbye.” The group today includes original members Stan Zizka and Tom Ferrara along with Edie Van Buren, Charlie Aiello, and Emilo Fornatura. The Earls, originally from the Bronx, NY, present a unique combination of classic doo wop vocals and upbeat contemporary sound. Their novel approach to the oldies of the early rock years bring back memories to those who “Remember Then” while still exciting audiences of all ages who are new to the sounds of The Earls. This iconic band has performed in resorts in the Catskills, Radio City Music Hall, Westbury Music Fair, Felt Forum, Madison Square Garden, the Academy of Music, the Claridge Hotel and many casinos in Atlantic City. The Flamingos featuring Terry Buzzy Johnson was inducted into the Rock and Roll Hall of Fame in 2001. Billboard magazine wrote, "Universally hailed as one of the finest and most influential vocal groups in pop music history." The Flamingos defined Doo Wop at its most elegant and sophisticated. The Rock and Roll hall of famer is still the musical and vocal arranger, songwriter, producer, first tenor, and lead vocalist for the group. Known for their countless hits which include “Golden Teardrops,” “Lovers Never Say Goodbye,” and the Flamingos’ anthem, “I Only Have Eyes for You.” The current Flamingos lineup includes Johnson, Starling Newson, Jr., Stan Prinston, and Musical Director Theresa Trigg.